Earl Loyal Hicks, Sr, of Cyril, was born November 18, 1932 in Apache to Earl Ray Hicks and Jessie Mae Bynum Hicks. He passed away peacefully on October 31, 2018 at his home at the age of 85. Visitation will be held at the Cyril Funeral Home on Friday, November 2, 2018 from 9am-7pm. Funeral services will be held Saturday, November 3, 2018 at 10:00am at Calvary Temple in Cyril, officiated by Kip Ackley. Burial will follow at Fairview Cemetery, Apache, under direction of Cyril Funeral Home. Earl enlisted in the United States Navy after graduating from high school. 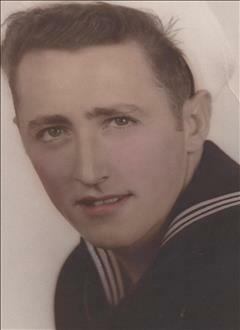 He proudly served our country from 1952-1956. After his honorable discharge, he became a paint contractor and owned his own salvage yard. On January 18, 1958 he married Shirley Ann Medlock in Carson City, Nevada. She preceded him in death in 2012. Earl enjoyed collecting and building antique cars. He also enjoyed racing cars at the Lawton Speedway from 1969-1981. Survivors include his children, Loyal Hicks, Jr and wife Tammy of Cyril and Mike Hicks of Anadarko; grandchildren: Dustin Hicks of Fletcher, Josh Hicks of Fletcher, Steven Hicks of Lawton, Sadie Crowe of San Diego, CA, Jonathan Hicks and wife Megan of Fletcher, Amanda Wilson and husband Mark of Lawton and Ashley Hicks of Fletcher; great-grandchildren: Hayden Hicks, Dustin Waldorf , Kaylie Waldorf, Tyler Knight and Tessa Groff; and niece, Jessie Ann Hicks. He is preceded in death by his parents, Earl and Jessie Hicks, wife, Shirley Hicks, son, Greg Hicks, and brother, Argle Hicks.